Even in hard times, estate agents north of the border can usually rely on the Scottish diaspora to provide buyers for historic country houses and estates. 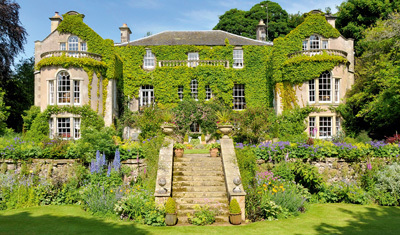 With the official Register of Scotland’s latest quarterly report confirming a steady revival in the national housing market, a recent surge of interest in country estates from buyers with Scottish connections is helping to kick-start the long-awaited recovery in the country market. And as the backlog of unsold country properties begins to clear, owners of country estates are evidently more inclined to come to the market in anticipation of a lively autumn campaign. The launch of the historic, 10,143-acre Cluny estate at Laggan, Invernessshire, through Savills (0131- 247 3700) and Smiths Gore (0131- 344 0880) at ‘offers over £7.5 million’, is expected to set a new benchmark for this year’s Scottish estates market. 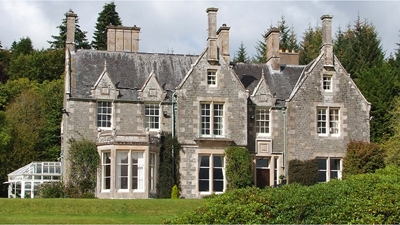 ‘With many more deals being done in the country, a spectacular Highland sporting estate such as Cluny-with its magnificently refurbished category A-listed house, renowned deer forest and grouse moor, salmon fishing on the Spey and Calder, substantial farming enterprise, and glorious setting only 1 hour’s drive from Inverness- is bound to cause a stir internationally,’ comments John Coleman of Smiths Gore. There are several Cluny estates in Scotland, but the first recorded mention of this estate was in 1482, when James III gave the lands to Alexander Gordon. From the late 16th century until its forced sale in 1943, the estate was the seat of the Macphersons of Cluny, before being bought by the Lindsay family, and then by the current owners in 2001. 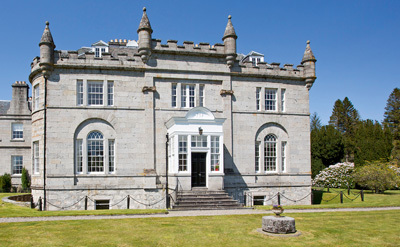 The present Cluny Castle was built in 1805 to replace an earlier house burnt in 1746 following the clan’s defeat at Culloden. Between 1888 and 1899, the estate was let to the Scottish industrialist Andrew Carnegie, who persuaded the owner to build a billiard room, still known as the Carnegie wing, which has been knocked into one by the current owners to create a superb open-plan kitchen, dining room and sitting room, as part of their remodel ling of the early-19th-century mansion between 2001 and 2002. The house has three elegant main reception rooms -the bow-ended drawing room and the dining room are particularly fine -along with seven main bedrooms and five bathrooms. Eleven estate houses and cottages are used to house staff or could be developed as holiday lets. The Scottish Borders has always been a happy hunting ground for buyers with family or business interests on either or both sides of the national divide. Robert McCulloch of Strutt & Parker‘s Edinburgh office (0131-226 2500) reports solid British interest in the 480-acre Hoscote estate at Roberton, in the glorious Borthwick Water valley in upper Teviotdale, nine miles south-west of Hawick, yet little more than an hour’s drive from the Scottish capital, for which ‘offers over £2.95 million’ are being sought. Since moving from Manchester to Hoscote in 2001, owners Duncan and Barbara Arthurs have developed the estate as a successful hospitality business, which carries a five-star rating from the Scottish Tourist Board. There has been a house of some kind on the site since the 1500s, but the present Hoscote House was built in 1858 for John Stavert, whose family bought the estate in 1786 and owned it until 2000. As well as the beauti fully refurbished nine-bedroom main house surrounded by immaculate formal gardens, the estate includes five modernised houses and cottages, an in-hand livestock farm supporting Zwartbles sheep and Highland cattle, and 115 acres of woodland plantations. It also offers an informal driven pheasant shoot, roe-deer stalking, duck-flighting and trout fishing on Borthwick Water. Strutt & Parker are also handling the sale of secluded Culdaremore near Fortingall, in the heart of Highland Perthshire, another delightful small estate with a Category B-listed, five-bedroom main house, lovely gardens and a range of traditional stone buildings, surrounded by 375 acres of pasture, hill grazing and conifer plantations. Offers over £1.25m are sought for Culdaremore, which has informal red- and roe-deer stalking, fishing on the River Lyon, a tributary of the Tay, and the potential to create an exciting low-ground pheasant shoot. Steeped in clan history, the land around Culdaremore includes the celebrated MacGregor’s Leap where, in 1569, Gregor MacGregor, an ancestor of Rob Roy, reputedly jumped a chasm across the River Lyon in his bid to escape the pursuing Campbells, having avenged a Campbell attack on some of his clansmen. The feat has never been repeated, but it brought Macgregor only temporary relief, for he was hanged soon afterwards when the Campbells finally drove the MacGregors from Glen Lyon. Good-looking houses near water on Scotland’s west coast have been selling well throughout the recession, reports Ran Morgan of Knight Frank in Edinburgh (0131-222 9600) who have recorded some notable sales in the region this year, at prices ranging from £2.85m to more than £6m. The guide price of ‘offers over £1.25m’ for the picturesque, 194-acre Achara estate near the Highland village of Duror, near Loch Linnhe in coastal Argyll, represents ‘exceptional’ value for money in today’s market, Mr Morgan suggests. This is another area steeped in bloody Scottish history, being close to the scene of the notorious Glencoe massacre and the infamous Appin murder of 1752, when the Jacobite James Stewart was unjustly convicted and hanged for the murder of the government-appointed factor to the forfeited estates of the Stewart clan in north Argyll. Achara House itself was remodeled in the early 1900s around a 19th century farmhouse belonging to the Stewarts of Ardsheal. The house was built in the Scots Baronial style and listed Category B, and family folklore holds that the architect was Sir Robert Lorimer himself, who met Charles Stewart at Ardkinglas and drew the design for the new house on a napkin. For the past 20 years or more, Achara has been the much-loved holiday home and spiritual retreat of its present owners, who have appreciated the estate’s unique atmosphere and landscape. In addition to the imposing, eight-bedroom main house overlooking Loch Linnhe, the estate boasts a converted three-bedroom coach house and two cottages suitable for holiday lets. The country-house market has been the Cinderella of the Scottish property scene since the start of the recession, a fact reflected in the bargain prices currently being quoted in many prized rural areas. 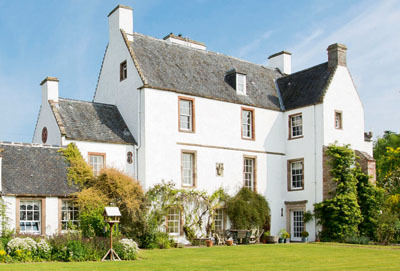 For instance, Smiths Gore (0131-344 0880) quote a guide of ‘offers over £950,000′ for historic, Category A-listed Lessudden House on the eastern edge of pretty St Boswells village, 4-and-a-half miles from Melrose, Roxburghshire, and within a realistic commuting distance from both Edinburgh and Newcastle. Originally built as a peel tower for Melrose Abbey, the house was rebuilt around its ancient core in the late 16th century, having been destroyed by the invading armies of Henry VIII in the ‘Rough Wooing’ of 1544. In the 17th century, the house was bought by the Scotts of Raeburn, who lavished love and attention on it, building a splendid new staircase, enlarging windows to let in more light and adding a new east wing. In 1684, they also built a burial aisle in the grounds, where many of the Scott family lie. Lessudden’s best-known residents were probably Walter and Jean Scott, uncle and aunt of Sir Walter Scott, who was a frequent visitor.  In 1968, the house was sold privately to Pamela, Lady Lever, the mother of the present owners, Alasdair and Angela Douglas-Hamilton, following the death at the ripe old age of 100 of Miss Louisa Scott, the last of her line. Approached along a private drive lined by wild geraniums, Lessudden House sits in the midst of 19 acres of enchanting gardens and grounds, surrounded on three sides by parkland grazing. Accommodation includes reception and dining halls, two further main reception rooms, five main bedrooms and an attic bedroom. A range of stabling offers potential for development subject to planning consent. Still in the Borders, Jamie Macnab of Savills (0131-247 3700) has launched two distinguished country houses on the market in recent weeks, both of which are likely to appeal to homing Scots. Georgian Wellfield House and Lodge at Duns, 15 miles from Berwick, was originally built for the sheriff of Berwickshire in about 1780, and is believed to have once been part of the Duns Castle estate. Offers over £1.5m are sought for the impressive five-bedroom, Category B-listed house, and its C-listed two bedroom lodge. The main house, built of harled stone under a slate roof and set in some eight acres of wooded gardens and grounds, was extended in 1895 and again in 1903 by the architect James Alison. Offers over £1.65m are sought by Savills for Leithen Lodge at Innerleithen, Peeblesshire, a striking Arts-and-Crafts house, listed Category A, which nestles in the hills to the north of Innerleithen, surrounded by wonderful, rugged countryside, yet only 25 miles from the Scottish capital. The ancient forest of Leithen was a royal hunting ground before being gifted to the monks of Newbattle Abbey in 1241. In 1560, following the Reformation, a timely conversion to Protestantism secured the Leithen Hopes estate for the former commendator of the abbey and his successors. 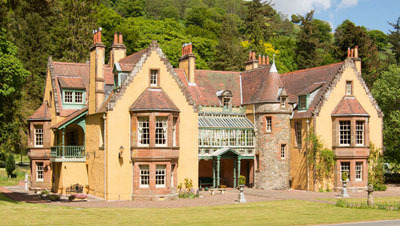 Thereafter, Leithen Hopes, as it was known, passed through various hands, and was remodelled a number of times, before being rebuilt in the Arts-and-Crafts style in the late 1800s. In the 1940s, the estate was bought by the Rosebery family and the house was let for many years. 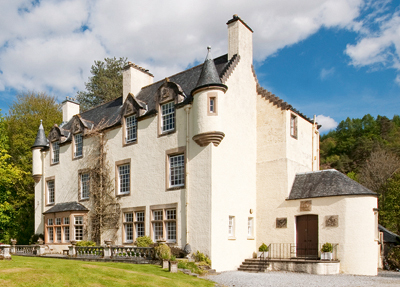 In the early 1990s, Leithen Lodge, listed Category A, was rescued and restored by David Lumsden. In 2004, the current owners bought the house and have since refurbished the three-storey main house, its courtyard apartment and wing, and its 20 acres of gardens, grounds and parkland. One part of rural Scotland that has bucked the general downward trend of the country-house market is the area within 25 miles of Aberdeen, where the Banchory office of Strutt & Parker (01330 826888) is selling ‘the hidden gem of Donside’, the House of Aquahorthies near Inverurie, with a guide of ‘offers over £1.3m’. For sale for the first time in 38 years, the imposing, nine-bedroom house, built in about 1797 and listed Category A, stands in some 38 acres of landscaped grounds, woodland and paddocks in an idyllic south-facing position on the slopes of Bennachie in the picturesque Don Valley, 20 miles from Aberdeen.